Nutshell: Rock Springs, Kentucky - last chance for the second-rate. Or even third. Slaves had no choice, of course, until the Civil War freed them. Free to what? Get lost. "A novel set in Kentucky in the 19th century is quite a change of direction, but Robinson has succeeded with this hugely enjoyable book... Forbidden love, kidnappings and false accusations help the plot along but it is the historical backdrop and the supporting cast that steal the show... a wonderful novel...full of hilarious and thought-provoking incident." Nutshell: You're an American airman, washed ashore on the most heavily fortified part of Hitler's Europe: the island of Jersey. You want to blow it up. The islanders think otherwise. Who's right? "There are no stereotypes here... Each character has a life of his own. Rotten With Honor more than passes the final test. You're sorry when it's over." Rock Springs is a backwater. It's as high upstream as the riverboats can go, which is why, in the 1840s, the settlers who got off the boat reckoned the West could wait, this was good enough. The town grows like a Hollywood saga turned on its head. The people do their best but their main product is failure. One man's calamity being another man's joke, you might say they make their own entertainment. It's 1944. Lieutenant Kramer, sole survivor of a ditched American bomber, crawls ashore one night. He knows he's in Europe when he sees a German sentry, so he kills him. That's what war is all about, isn't it? Then Kramer discovers he's on Jersey, in the Channel Islands, the only part of Britain occupied by Germany. 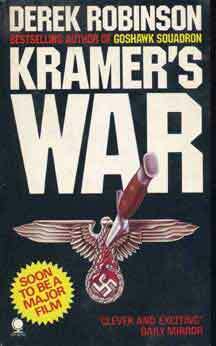 Hitler's armies have made it a stronghold, and Kramer finds it an irresistible target for sabotage. But the islanders have spent the past four years working out how to survive. They know that resistance is worse than pointless, it's stupid, because it damages everyone and accomplishes nothing. Since Jersey must import food, co-existence is essential. Someone had better tame Kramer before he runs amuck. With the best intentions, of course. Starin, head of Soviet Intelligence in London, is good at his job. Too damn good. How can British Intelligence get rid of him? Maybe let him steal one of the West's biggest military secrets and take it back to Moscow - despite the efforts of one of the best British agents. When the secret turns out to be a dud, so is Starin. That's the plan. Unfortunately, all the best British agents are busy, so the job gets given to Hale. Nice chap, Hale. Very honourable. We shall miss him. The three novels shown above are out of print but will soon be available as e-books. The following websites may be may be useful for tracking down secondhand copies.